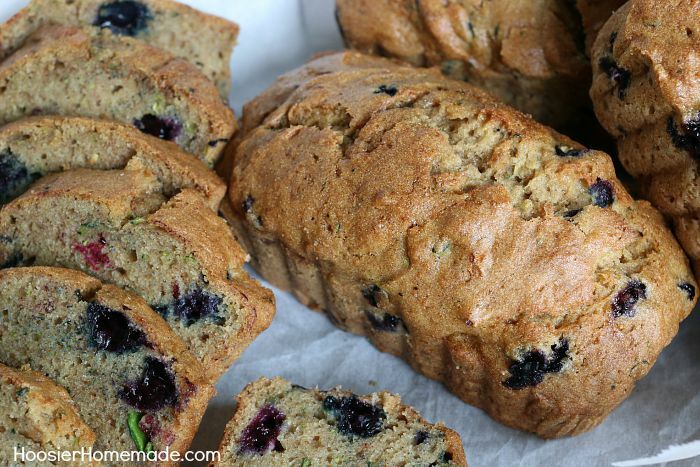 Blueberry Zucchini Bread Recipe – this delicious, moist bread is a MUST make! SHH…don’t tell the kids it has veggies in it though, they will never know! The Zucchini and Blueberries make a double punch of flavor with all the great nutrients for you! Out of all the quick bread recipes that I bake, I have to say that Zucchini Bread is my favorite. Of course, Banana Bread is not far behind! This Blueberry Zucchini Bread Recipe is perfect for just about any time – breakfast, a snack, or even dessert. Now that school has started, it would make a great treat for lunchboxes as well. Zucchini are one of those vegetables that are super easy to grow. In fact, they are almost too easy. You can look at the small zucchini growing on the plant one day, and it seems like the very next time you look at it, the zucchini are as large as baseball bats. I actually like those size of zucchini the best for baking. Zucchini also freezes really well. Wash them, chop them in a food processor and put 2 cups (which is typical for most recipes) in a freezer safe bag and you are done. 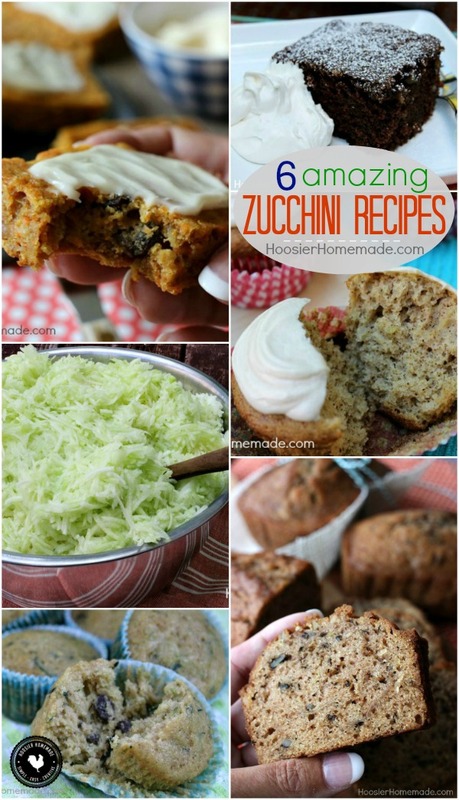 Having zucchini to whip up a batch of bread or muffins…or even Zucchini Cupcakes during the Winter months is the best. 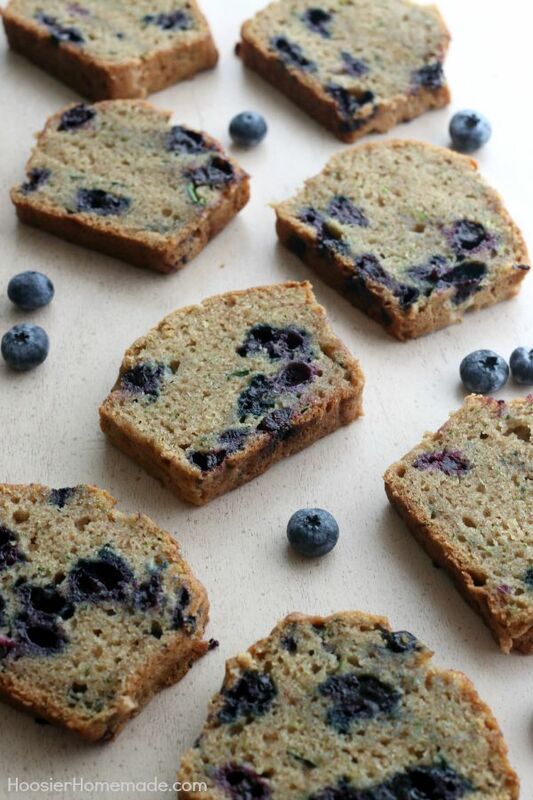 This Blueberry Zucchini Bread Recipe starts with the same Zucchini Bread Recipe I have been using for many, many moons. It came from my Aunt, my Dad’s sister, and her neighbor lady, who was a wonderful baker. The addition of blueberries takes the bread to a whole new level, making it even more moist than it already was. This time I left the skin on the zucchini when I chopped it, but you can certainly peel it off. The kids will never know they are eating Zucchini, be sure to peel the zucchini before chopping and they won’t even know the difference. 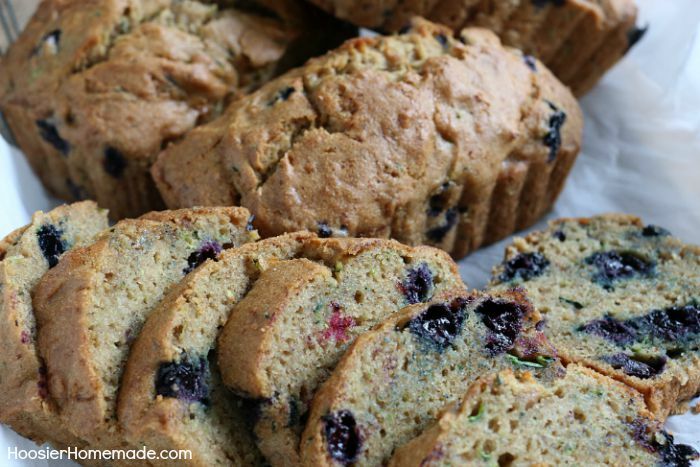 This Blueberry Zucchini Bread Recipe makes 5 small loaves. I like baking quick bread in small foil pans (4″x6″), they are easy to store and freeze well too – that is if it makes it to the freezer. I have a couple loaves set back for our son at college, although I should probably bake another batch the way homemade treats go so fast with all his friends. 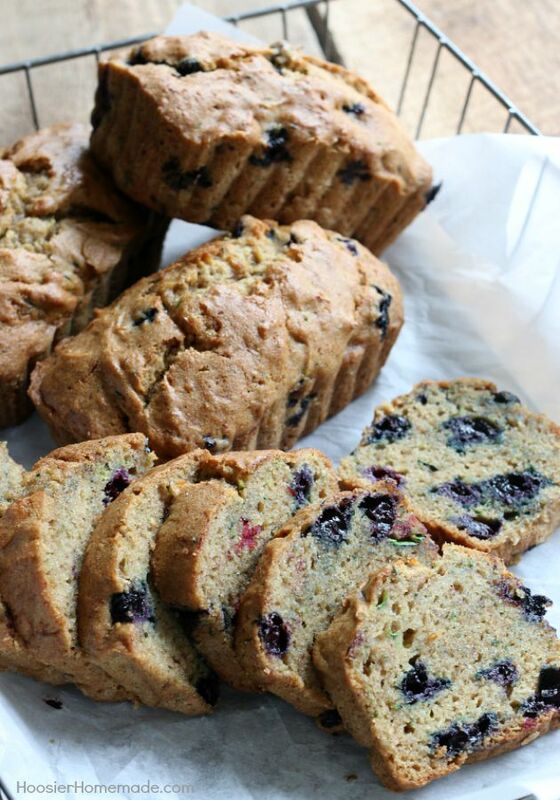 Blueberry Zucchini Bread Recipe - this delicious, moist bread is a MUST make! SHH...don't tell the kids it has veggies in it though, they will never know! The Zucchini and Blueberries make a double punch of flavor with all the great nutrients for you! Preheat oven to 350 degrees. Lightly grease and flour bread pans. This recipe will make 6 small loaves, or 2 large loaves, or a combination of the two. Beat eggs in large bowl, until foamy. Add sugar, oil and vanilla, mix well. Add cinnamon, salt, soda, and baking powder. Mix well. Add the flour and zucchini alternately, mixing well after each addition. Bake for about 30-40 minutes for mini loaves, increase time, depending on the size of your loaf. Foil pans are 4" x 6"
How would this turn out if you added 1 teaspoon of vital gluten? Hi Beth, I’m not sure about the vital gluten, I have never used it before. Oh my yumminess! This recipe as simple and was easily turned into a bundt cake. I just had to add a little bit more time in the oven. Thank you so much. Definitely going to be a requested item after the rest of the family try it. Using a bundt pan is such a great idea! Glad you loved it! Looks delicious! What sort of oil did you use? Hi Rhiannon, when baking I typically use canola oil or vegetable oil. This is a great recipe! Everyone that I have serve it to has said that it is the best zucchini bread that they have ever tasted.